Development and spread of drug resistant microorganisms is a major health issue which, accompanied by an attrition in drug development, is expected to worsen in the near future. Drug resistance development in the individual is driven by intrinsically stochastic events like mutation, selection, growth and extinction of microbial strains (to name a few). The chemical master equation (CME) provides a formalism to accurately model these processes. A major mathematical drawback is the fact that the CME cannot be solved directly due to its numerical complexity. We aim to understand and accurately model drug interference and resistance development in viruses and microbes (see Kleist et al. 2010, Frank et al 2011, von Kleist et al. 2012, Rath et al. 2013, Meixenberger et al. 2014, Meixenberger et al. 2014, Yousef et al. 2015, Duwal et al. 2016). Secondly, we aim to devise optimal treatment strategies to mitigate and reverse drug resistance development. Regarding the latter, we could already show in von Kleist et al. 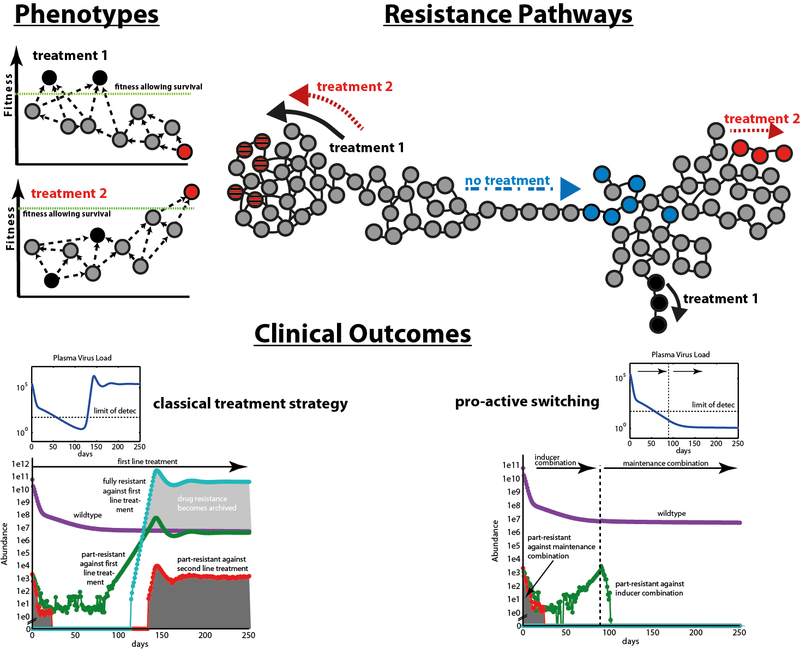 2011 that treatment alternation may mitigate drug resistance development in the individual. The mathematically (and practically) optimal solution to the problem however requires to formulate an optimal control problem, applicable to a CME model of microbial resistance development. In order to solve this problem, we devised numerical methods and mathematical formulations of optimal control strategies typically encountered in medical applications (e.g. Winkelmann et al. 2014, Duwal et al. 2015). Furthermore, when different assumptions about the controllability of the disease process are given, we aim to comparatively assess the underlying treatment paradigms (e.g. Duwal et al. 2015). As an example, feedback strategies rely on diagnostics and result in patient-specific treatment (and diagnostic) decisions. To the contrary, pro-active strategies may anticipate all possible stochastic disease trajectories and may only depend on the initial probabilistic disease state of the patient. When diagnostics are unreliable, or too expensive, the latter approach may be favourable in practice (Duwal et al. 2015). Recently, we extended these approaches and proposed a hybrid control framework, which enables to use a feedback control framework whenever intrinsic stochasticity requires such, and an open-loop strategy in scenarios where the process is almost deterministic (Zhang et al. 2015). Computational costs are drastically decreased in the hybrid framework, enabling to accurately model the process and to practically compute optimal controls. Applications include bacterial and viral infections. For HIV, the main focus is on a) prevention of infection through administration of antiviral medicine (treatment for prevention or (pre-exposure) prophylaxis), and b) on treatment optimization with regard to evolutionary dynamics. Regarding bacterial infections, we c) focus on optimal antibiotics combinations to control resistance development. This work received funding through MATHEON project A21 and is currently funded through ECMATH project CH4 and an BMBF junior research group, see funding.